Roman blinds are gaining in popularity as customers realise the possibilities of enhancing their interior design with elegant, sophisticated-looking window treatments. When fully lowered, the blinds hang flat much like any roller blind, but when they are raised (operated by a cord mechanism), the blind forms soft pleats which are kept in place by slats or rods that are sewn into the lining. 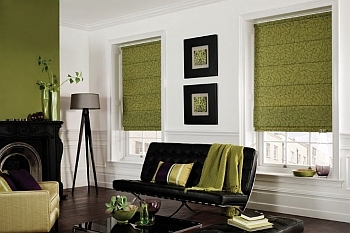 This means that even when your blinds are open, they create a stylish addition to your soft furnishings. There are many things to consider when choosing the perfect blind, from the style to the installation requirements to the ease of keeping it clean, but the most important aspect is, of course, the light. How much light do you want to come in through the window? Do you need to let light in or do you need to keep it out? Even when blinds are closed, some light can still ‘leak’ through, but if you want to keep as much light out as possible (if, for instance, you’re using a monitor or some other kind of screen where glare can be a problem), you may want to consider a roman blind with a blackout lining. While roman blinds can be used in any room of the house or office, they are often better suited to areas like the lounge or bedroom, where cleaning isn’t required as often as it is in places such as the kitchen or bathroom. 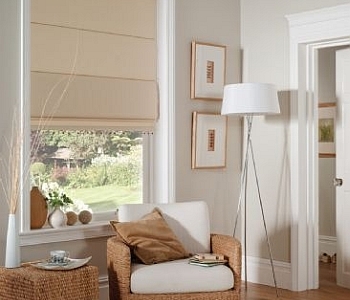 Maintaining this type of blind can sometimes be a challenge due to the way the fabric bunches up, but if your main concern is style, then roman blinds are perfect – you can choose a type of fabric which will match your décor and other accessories, and they can even add a touch of elegance to a room that you wouldn’t get with a simple roller blind. It all depends on what your top priority is, so decide on your main concerns before choosing which type of blind would be best for you. If you’re trying to achieve a more sophisticated look in places such as the bedroom and lounge, roman blinds will help you do this. Unlike the minimalist look gained from simple roller blinds, roman blinds tend to give off a more luxurious feel, especially if paired with stylish furniture in similar colours or wall and floor finishes in contrasting colours. If you have several windows or a large feature window, the treatment you choose can even become a main focus of the room, so it’s worth considering the elegant-looking roman blinds for areas where you’re more likely to entertain guests or spend a lot of time in yourself. Also, if you want plenty of light to enter the room in order to make the area feel bigger and more spacious, white roman blinds will achieve this as they will reflect the sunlight coming through the windows. In terms of workplaces, many office-type buildings tend to go with the more minimalist look of roller blinds, but if you work in the leisure or hospitality industry, window treatments like roman blinds can make a big difference to the space, whether it be in a restaurant, a hotel, or any other building where style is of the upmost importance.